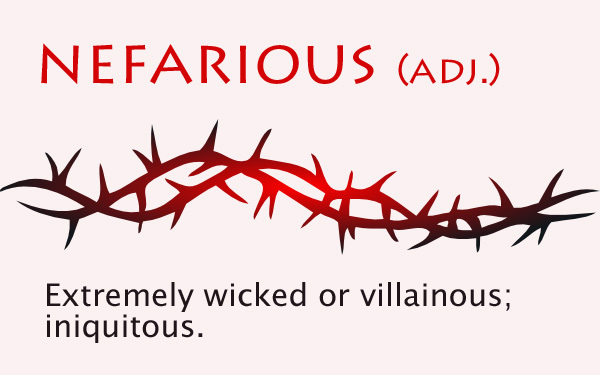 To my ear, nefarious is one of those words that sounds like what it means. Just saying, “nefarious plans” sounds pretty evil. The sound of the word isn’t the only reason I’m including it, however. The second part of the meaning, iniquitous, says so much about the crux of being “wicked” or “villainous.” The deeper one digs into the meaning, one finds that a lack of justice or injustice is at the root of evil treatment. Humanity has a long history of iniquity—unfair treatment due to race, gender, sexuality, and other biases or perceived differences. Eventually, history shows us that these actions are indeed nefarious. Sometimes the road to that point on the timeline is a long and bitter one.